My colleague Lisa Hajjar just returned from testifying as an expert witness at the deportation hearing on Monday, May 12, 2008 of Mohammad Qatanani, 44, an imam in New Jersey who has lived in the United States since 1995. AP covered the first day's testimony and you can read the International Herald Tribune version here. Qatanani is being accused of hiding from the U.S. a 1993 conviction by the Israeli military courts, grounds for deportation. 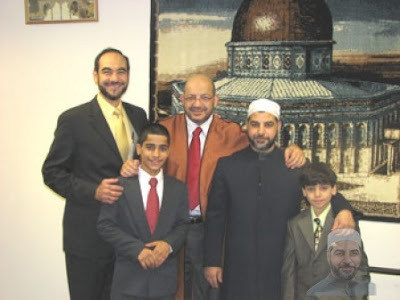 Hajjar told the judge that she did not believe Qatanani really was convicted, and that it appeared that Israel had invented this conviction only for purposes of depriving him of a U.S. green card, after Qatanani had established himself as a popular imam in New Jersey. The main evidence for this speculation is that the United States had no records that indicated Qatanani had been convicted of anything, but had produced only an Israeli statement that Qatanani had been convicted of something (not clear what the charge was) in a NON-military court, where Qatanani had never been charged. According to Hajjar, the only conviction record Israel attached was for another individual altogether, someone whose inclusion in Qatanani's file seemed random. This event seems consistent with other ICE document fraud, where either ICE attorneys assert that legitimate records aliens present are not legitimate, or, as in the case, present documents that do not establish the ICE attorneys' claims. Fortunately for Qatanani he has a good legal team with the resources to hire experts who could pick up on these problems and explain them to the judge, much to the exasperation of the ICE attorneys, Hajjar told me. But imagine the 95% of cases in which aliens lack attorneys, much less professors, to testify on their behalf.